The caramel stays nice and chewy, even straight out of the refrigerator, so consider yourself warned, this is going to call to you at all hours. 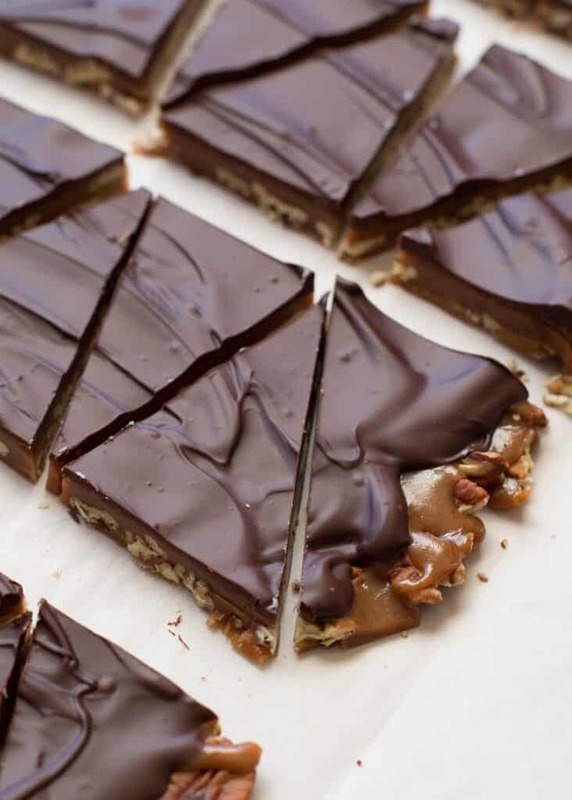 I highly recommend making this Chewy Caramel Turtle Bark and immediately sharing it with some friends. I’ve made this a couple times now and played with the recipe a bit. 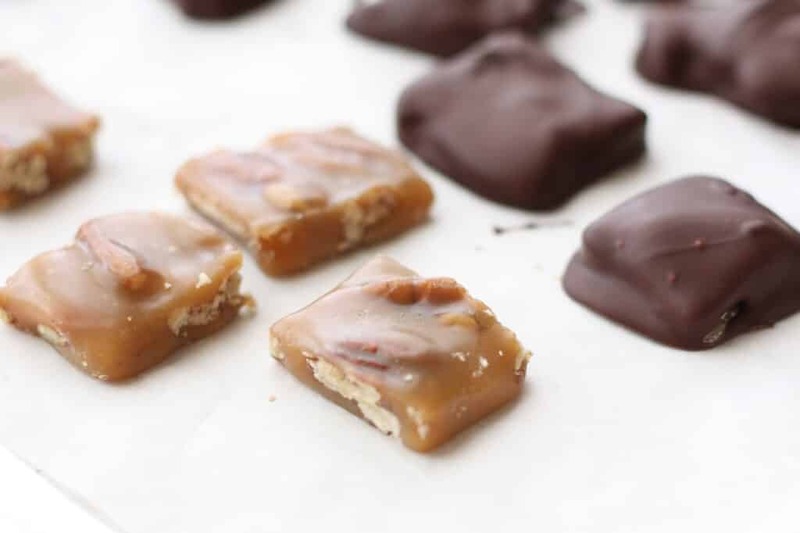 I’m sharing a recipe for chocolate covered turtle bites as well because I liked them so much. 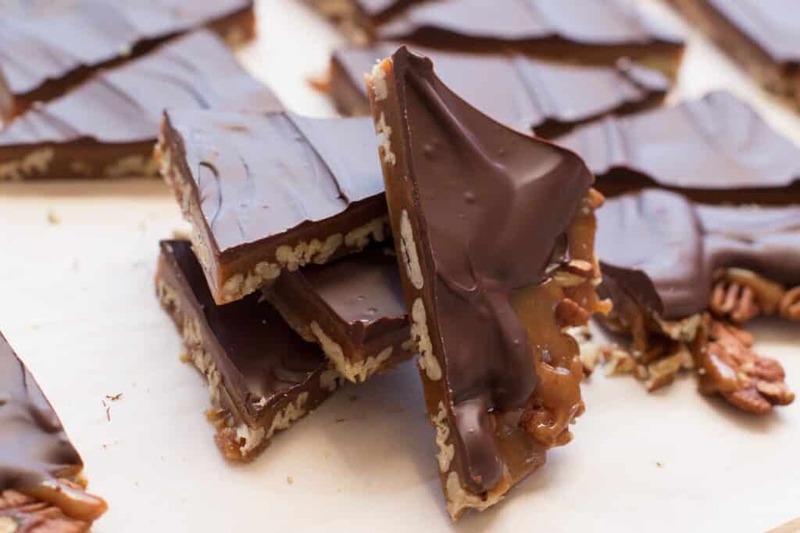 If you are pressed for time, the bark is very simple and other than the cooking time for the caramel, it comes together with just a few minutes effort. 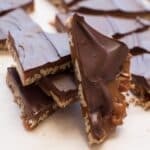 If you’re feeling a little more ambitious, cut apart the caramel pecan layer and dip the individual pieces in chocolate to make bite-size turtle candies. Let the caramel and pecan layer chill in the refrigerator for about an hour. Then use a very sharp knife to slice it into bite-size pieces. Place in the refrigerator again for about 30 minutes. Melt the chocolate and the oil in a small mixing bowl in the microwave. 50% power for 2 – 2 1/2 minutes, stopping to stir after the first minute and then every 30 seconds as needed. Dip each caramel piece into the melted chocolate and then use two forks to drain the excess chocolate off the candy. Place on a parchment lined tray and repeat with all the pieces. Chill in the refrigerator until firm. Place in an airtight container and store in the refrigerator. Enjoy! Kitchen Tip: I used this sheet pan and this saucepan to make this recipe. Line a large baking sheet with parchment paper and spread the pecan halves across the paper in a single layer. Set the tray of pecans near the stove. Combine the butter, sugar, honey, milk and salt in a heavy bottomed saucepan or deep skillet over medium heat. 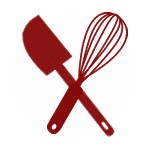 When the mixture has melted together and is smooth, increase the heat to medium high and continue stirring constantly with a heat proof spatula or wooden spoon. The mixture should come to a rolling boil. Let it cook until the temperature reaches 230-235 degrees, this took less than 5 minutes on my stove. Remove from the heat and stir in the vanilla. Pour the caramel mixture over the pecans in an even layer. Use a spatula to spread it across if needed. Chill in the refrigerator for 30 minutes or so, until the caramel is cool. Melt the chocolate and the oil in a small mixing bowl in the microwave. 50% power for 2 – 2 1/2 minutes, stopping to stir after the first minute and then every 30 seconds as needed. When most of the chocolate has melted and you are able to stir it, remove from the microwave and stir until smooth, it will continue melting as it rests. Pour the chocolate over the top of the caramel and pecans and spread across the caramel with a spatula. Chill in the refrigerator an additional 30 minutes, until the chocolate is firm. Remove from the refrigerator and use the parchment paper to lift the bark onto a cutting board. Use a sharp knife to slice into pieces. Place in an airtight container and store in the refrigerator. Enjoy! I typically set it out for a little while prior to slicing or serving. It should soften at room temperature. If it doesn't soften, I'm guessing that it has cooked closer to toffee than to caramel, so maybe the first batch was closer to hard candy? Sorry, but I am a detail person. I know it says use a large baking sheet, but approximately what size pan would you be using then? I use a "half sheet" pan. 18x13 inches. I hope that helps! When it reaches a rolling boil, should you continue to stir constantly until it reaches 230-235 degrees or should you allow it to cook unstirred? Thanks. I do not stir it. Enjoy! Any reason you can't pour the chocolate over the melted caramel and let them cool just once combined?